secondary school and she then took on the challenging role of Julia in A Month of Sundays. Claire was part of the hilarious line up for Cash on Delivery and as Aggie Wheeler in the thriller The Game’s Afoot. She also took part in our rehearsed reading of The Browning Version last summer. She will be remembered for her delightful singing as Mary Poppins in The Even Greater Cheriton Variety Show and she says she is delighted to be co-directing A Very International Variety Show. Peter (Theo) Theobald (Music Director) Theo is a retired primary teacher who for forty-odd years has been involved in productions with school plays, choirs and concert bands. 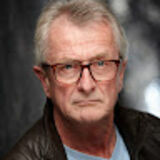 He has been the MD for West Meon Theatre since 2001 and has written original music for all Shakespeare plays since then, Cider with Rosie (2009), Calendar Girls (2013), The Cherry Orchard (2016) and has arranged music for pantomimes, one act plays, youth theatre and most recently Nell Gwynn (2018). Theo has also been MD for Winchester Musicals and Opera Society in Oh What a Lovely War (2014), an originally written musical production of Midsummer Night’s Dream (2016) and an updated version of Utopia Limited by Gilbert and Sullivan (2018). He also plays the tuba in Thornden Community Wind Band and keyboards in a local barn dance band, The Bursledon Village Band. The Programme Join us on a journey around the world this evening, from Argentina to Kathmandu, sit back, relax and enjoy this truly multi-cultural smorgasbord of International fare. And not one mention of the ‘B’ word on anyone’s lips, we promise! Show Directors	Tracey Anderson, Claire Smith Music Director & Accompanist	Peter Theobold (Theo) Saxophonist	Bernard Sully Producer	Jan Conway Choreographer	Claire Smith Wardrobe	Claire Smith, Ellie Pulleine Props	Tracey Anderson, Marilyn Weston Set DĂŠcor	Henrietta Hellard Sound & Lighting	Jamie Herdman & Graham Arnott Assistant Rigger	Mike Ludgate Stage Manager	Adrian Seale Set Construction	Dave Wright, Peter Reay, Paul Hellard, Craig Robertson Front of House	Sue Herdman and team Food and Catering	Annabel Peters, Steve Peters, Rosie Reay, Jan Conway and team Publicity/marketing	David Cradduck Poster/programme design	Ian Lock Photography	Craig Robertson Filming	Tom Steckler Please turn off all mobile phones and keep aisles clear at all times. Please refrain from flash photography and note that video or audio recording of the performance is prohibited. Our thanks to all those who have helped in any way behind the scenes, especially WMOS for the loan of costumes, and to those who have given of their time so freely. Please refrain from taking flash photography and in the interests of safety (and access for performers and Front of House staff), please keep aisles and walkways clear. Our gushing luvvy thanks... We feel very fortunate that we managed to convince Peter Theobald (Theo) to be our musical director. He has worked his socks off arranging, rearranging, creating and then rearranging again our music. Theo, you are amazing and incredibly patient – thank you! Weston, for making sure we all have the right props; Craig Robertson, for his wonderful photos; Helen Gard and Jo Stokes for allowing us to use their wonderful scripts; our chaperones Lisa Hubbard, Marc Carter and Katie Hinds for looking after our young performers. A really big THANK YOU to Sue Herdman for so ably organising the Front of House team; to Annabel and Steve Peters, Rosie Reay, Jan Conway and team for organising and preparing the food and to Viv Pain and Penny Scott for advice; and to Jamie Herdman, Steve Peters, Tim Conway and team for organising and running the bar. Finally, THANK YOU to everyone else who has helped in any way to bring this show to life! 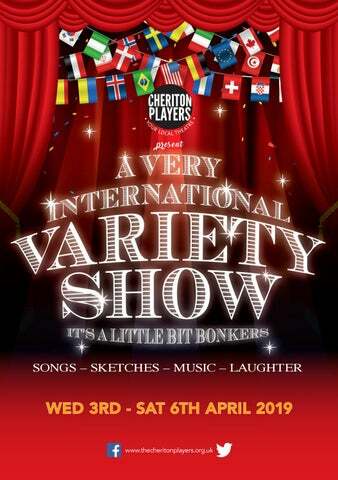 Cheriton Players is a small friendly theatre group always keen to encourage new members to join us onstage, backstage and front of house. If you are interested in joining the Players, please get in touch through the website www.thecheritonplayers.org.uk or by email to thecheritonplayers@gmail.com You can also join our mailing list through the website to receive our regular newsletters and details of future productions. We would love to hear from you! ON FILM Watch out soon for a short film about the Players being shot and edited by 3rd year film student Tom Steckler from the University of Winchester. Our thanks to him for his time and efforts to make us all look our best on film! mill farm trees Hedging Plants . Broadleaved Trees . Native Shrubs .
. Box . Buckthorn . Cherry . Crab Apple . Dogwood . Elder . Field Maple . Guelder Rose . Hawthorn . Hazel . Holly . Hornbeam .